Gisborne (Maori: "Great standing place of Kiwa") is a city in northeastern New Zealand and the largest settlement in the Gisborne District (or Gisborne Region). It has a population of 35,400 (June 2014 estimate). The district council has its headquarters in Whataupoko, in the central city. The settlement was originally known as Turanga and renamed Gisborne in 1870 in honour of New Zealand Colonial Secretary William Gisborne. 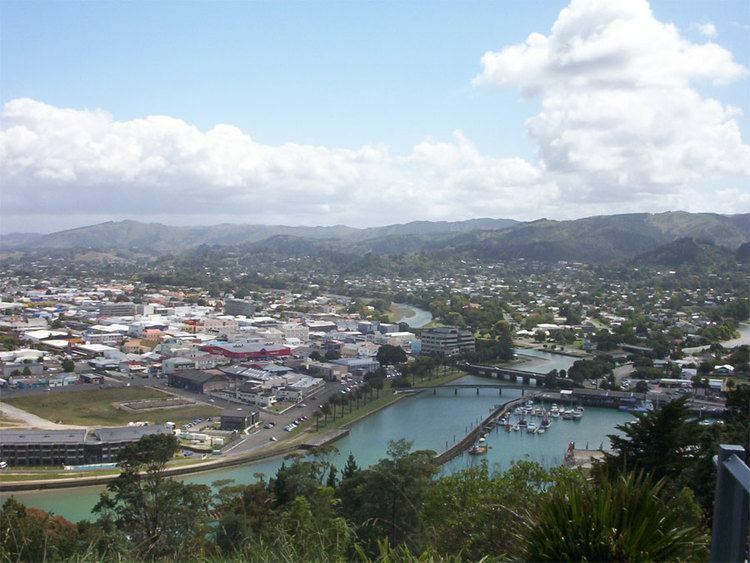 The city of Gisborne is located at the north end of Poverty Bay. The white cliff headland of Young Nicks Head at the other end of the bay is visible from the city. The cliffs can be seen in the left hand side of the sat photo. The Maori name for the cliffs is Te Kuri-a-Paoa, meaning The Dog of Paoa, as this was what it was originally said to look like. This prominence was the first part of New Zealand sighted by the crew of Captain James Cooks ship Endeavour, and was named for the crew member who first saw it. A memorial to Cook stands on the foreshore, marking the point where he first stepped ashore in New Zealand on 8 October 1769. It is sometimes known as the City of Rivers as the centre of the city is the convergence of three different rivers, one of which is the shortest river in the country at 1200 m long. Gisborne boasts being the first city in the world to greet the sun each day. However, in 2011, Samoa decided to skip a day to be moved westward across the international dateline, to align with trade partners, and its capital Apia thus can now claim that title. Before that move, however, Gisbornes claim was technically only true for part of the year. Both Suva, Fiji, and Nuku?alofa, Tonga, are closer to the International Date Line and therefore would seem more likely candidates for this title. Due to the Earths tilt on its axis, however, Gisborne does overtake their claim as New Zealand summer days grow longer. In the longest days of summer, though, it again loses the title to the hillier suburbs of Dunedin in the South Island. The city has the benefit of being very close to Waikanae and Midway beaches, both within easy walking distance of the city centre. Wainui Beach is 8 km from the city. It has consistent surf, and the local surf club has produced several world champions. The harbour was host to many ships in the past and had developed as a river port to provide a more secure location for shipping compared with the open roadstead of Poverty Bay which can be exposed to southerly swells. A meat works was sited beside the harbour and meat and wool were shipped from here. Now the harbour is the home of many smaller fishing boats as well as ships loading logs for export. Two major annual events are the Dawn Raid Beach Day Out, which is an outdoor concert featuring many of the Dawn Raid hip-hop stars held in January, and Rhythm & Vines, a 3-day New Years music festival, featuring well-known New Zealand and international bands performing in the vineyard setting of Waiohika Estate. In 2012 and 2013, Gisborne made skinny dipping world record attempts.